UhrMechanik currently features a flagship collection, the 1000 meters, available with black dial with luminous indexes or luminous dial with black indexes. The 42 mm case features a 60-clicks 45 mm bezel, and a 7 mm thick domed saphire crystal, which bring the total thickness to 17 mm and the water-resistance do 100 bar (static pressure of 1000 m). There is also a saturation diving valve for Helium gas, and the watch is powered by an ETA 2824-2 calibre. 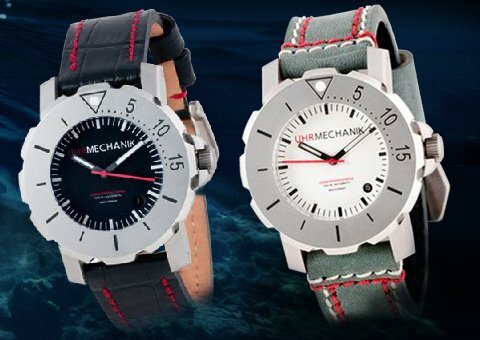 Both models come on a hand-made leather strap, and prices are USD 2,212.